Distance Education and Learning Technology Applications (DELTA), serving NC State since January 2000, strengthens the university’s academic offerings by supporting the use of technology to serve all learners. This unit equips students for an increasingly interconnected, global society with outstanding educational experiences formed with innovative technologies and pedagogies. 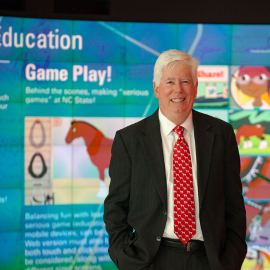 We recently sat down with Dr. Tom Miller, senior vice provost for academic outreach and entrepreneurship, who is also the founding vice provost of DELTA. He spoke to us about how DELTA works within the university and greater community, and promotes academic excellence by leveraging technologies to support innovative pedagogy across the spectrum of face-to-face and online classes. What is the role of DELTA at NC State? The role of DELTA is to foster the integration of technology for teaching and learning both on campus and at a distance. 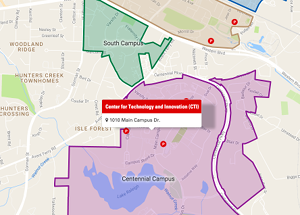 DELTA coordinates the funding and production of online and hybrid programs and courses for NC State. We are comprised of four functional units: Finance and Business, Distance and Distributed Education, Instructional Technology Support and Development, and Marketing and Partnership Development. We also promote educational excellence, which includes improved instruction and outcomes, by extending the reach of the faculty and fully utilizing technology and pedagogy in an efficient, effective and service-oriented environment to meet the needs of an ever-changing society. How does DELTA work with and support faculty and staff at the university? We have a number of ways to support faculty. We offer several workshops to faculty, staff, and teaching assistants, which is in essence a faculty development component specifically related to teaching and learning with technology. We have a DELTA Grants program faculty can apply for, which provides dedicated staff time and resources to the faculty member to help them apply technologies to their course. And then we do general consultations with faculty who are interested in learning how to use technology in their courses, or to develop an online course. We have a group of instructional designers, multimedia specialists, videographers and distance education specialists who spend a lot of time working directly with faculty. We also support staff in the colleges who directly support faculty. They work with us on a regular basis. In fact we have one position that is shared between DELTA and an academic department. DELTA also works closely with faculty and administrators on market research, strategies and implementation. With online programs there are no geographic monopolies, so it’s critically important for the success of each program to understand the market forces and address them appropriately. How do DELTA’s services and initiatives work toward NC State’s overall organizational excellence, and how does DELTA increase the university’s engagement outside of campus? I think the biggest part of our role within the strategic plan is the student success piece. We want excellence in all the courses that are delivered online, as well as the courses that are using technology here on campus. Our goal is to provide the best support possible to faculty and students to make them as successful as possible. We also extend the reach of the campus nationally and globally through the Online and Distance Education program, offering 90 degrees, certificates and licensure programs that serve 20,000 students annually. We have a saying around here that “the sun never sets on NC State distance education,” because we have students all over the world who are engaged with us. A big part of what we see as important is taking the very best, unique strengths of NC State in terms of academic programs and making them available everywhere. We think it enhances the reputation and extends the reach of the university, and really contributes to NC State’s strategic goal of local and global engagement. In addition, our DELTA staff are very engaged in the national conversation on online education and teaching and learning with technology, presenting and sharing best practices through conferences and publications. Also, in addition to our credit-based online offerings, DELTA has recently launched a new service, WolfWare Outreach, that provides support for delivery of non-credit online courses. Non-credit programming is big part of NC State’s land-grant mission of outreach and engagement, and we’re seeing online offerings in this sector expanding rapidly. In what ways does DELTA work to strengthen NC State’s academic reputation? We play a supporting role in that we provide the back office infrastructure, faculty training and support for those online programs. We have several online programs that are very highly ranked. The engineering program, the computer science program, the MBA program are all very highly ranked, and we are very proud to have had a part in that success. I believe that our proactive efforts in marketing have helped make these excellent programs better known outside of North Carolina as well. One of the things that I’m most excited about in terms of our student success initiatives is what we’re doing with large course redesign. We’ll work with the Division of Enrollment Management and Services to identify those large enrollment, gateway courses that are prerequisites for a lot of the majors that students may struggle with, and are challenged with typically high drop/withdrawal rates. We want to figure out how we can have more students successfully making it through those courses with fewer attempts. We use a variety of techniques to look at how we best combine the use of face-to-face time and technology to get the greatest transfer of knowledge, and the most student success. We have seen a reduction in the drop/withdrawal/failure rates in these courses, and increased success in the downstream courses — the next courses students would take in sequence — and the learning is sticking. That’s very exciting. What is something that people in the campus community may not know about DELTA? One of the things that I always talk to our staff about in meetings is that there’s been a lot of change. If you look at DELTA over the last 17 years of our history, we’ve gone from very little distance education and online activity to a huge amount,serving nearly half the students at the university at any given time. All of that change has been difficult for some, and much more rapid change than what we see in other parts of the university. I’m an engineer with a mathematical background, and my favorite saying is, “DELTA means change.” If you don’t like change, you don’t want to work here, because it’s not going to be a static environment, it’s going to be changing all the time and your ability to adapt is key to the success of our organization and of the faculty and students we support. Rapid changes mean that what we do today might not be the same thing that we do tomorrow. We started from broadcast television and videotapes to DVDs, and now everything is entirely online, and that’s happened in a very short period of time. Being comfortable with that rapid rate of change is important. 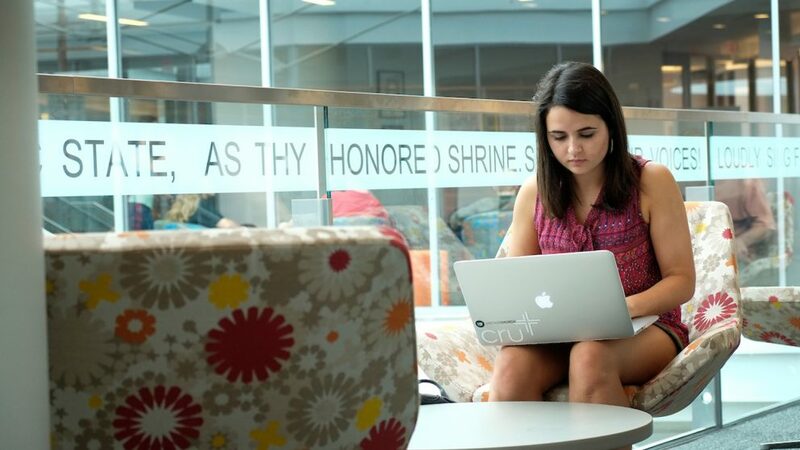 Learn more about how DELTA fosters the integration and support of learning technologies in NC State’s academic programs, both on the campus and at a distance.